Seeing a chiropractor in Barrie can help you find solutions for the chronic pain that you have been battling for years. Chiropractor in Barrie – When you are dealing with chronic pain, determining what to do to achieve long-term relief brings up some important questions. If you are exploring your treatment options, chiropractic care may have come up. If you have you considered going to the chiropractor, but you aren’t really sure what to expect or if you’ll find relief, you may be happy to learn that chiropractic care can benefit you in many ways. Seeing a chiropractor is widely recognized as one of the safest, drug-free, non-invasive options available for a number of bodily ailments and conditions. Whether you have discomfort due to your work requirements (such as ongoing sitting or standing) or you have sustained an injury and want to pursue alternative treatment modalities, seeing a chiropractor may provide you with the relief you need. It can also be used in conjunction with other treatments to provide you with the opportunity for total-body wellness. At Mapleview Chiropractic Centre, our team is dedicated to providing you with answers to your questions and helping you address your concerns, so you can function pain-free. Whether it is your first time seeing a chiropractor or you are looking for a new chiropractic clinic to continue ongoing treatment, you will find a comfortable place to stay on track with your wellness goals. 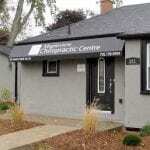 We offer a wide variety of treatment options at our chiropractic clinic. What are some of the benefits of seeing a chiropractor? While chiropractic care cannot “cure” every ailment, there is evidence to indicate that chiropractic adjustments can and do have a beneficial effect on a variety of conditions. Seeing a chiropractor may also alleviate secondary or referred pain that comes from your musculoskeletal system responding to the primary cause of your pain or discomfort. Additionally, many amateur and professional athletes see a chiropractor as part of their overall health care, fitness and maintenance program. Chiropractic care is often used to improve muscle and joint conditioning, which has a direct and positive effect on athletic performance. Unsure about chiropractic care? We can ease your concerns. Seeing a chiropractor can often help you find solutions for your chronic pain that you have been battling for years. Furthermore, general chiropractic care is also ideal for boosting the immune system, as well as better overall movement and alignment, and is combined well with other treatments, such as massage. Talking with your chiropractor at Mapleview Chiropractic Centre about your wellness goals can help you create the plan that brings about the most effective results. Whether you are an athlete looking to improve performance or an expecting mother who needs relief, you will find that our chiropractic clinic at Mapleview Chiropractic Centre in Barrie has the services you need. Contact us to make an appointment and to learn more about the services we provide. We look forward to seeing you soon! At Mapleview Chiropractic Centre, our chiropractor proudly serves residents of Barrie, Innisfil, Angus, Midhurst, Oro-Medonte, Thornton, Orillia, and Alliston, Ontario. Stop putting up with back and joint pain. Get in touch and find out how we can help.